BACKGROUND: Tobe and Sally, the owners of Reef House, discovered the island of Bequia more than twenty years ago on a scuba diving vacation. They were totally charmed by the quaintness and beauty of this small island and embraced by the friendly attitude of the local residents; so they just kept coming back. They rented homes at various locations around the island and then in 2007 made the decision to purchase land and build their own home overlooking Industry Bay, so named for the coconut plantation below the house. Needless to say, this was not an easy thing to do being that they live in Santa Barbara, California; but with lots of patience and hard work, Reef House, Bequia was created! DOES THE NAME OF THE HOUSE HAVE SPECIAL MEANING? Definitely YES! We named the house after the off shore Industry Bay Reef that one sees from every part of the property. The owners chose this site specifically because of the powerful views that will captivate and entertain you from the moment you arrive. 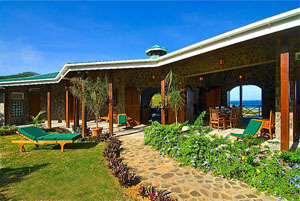 Reef House (completed in June, 2011) is built on land above Crown Point that has a history intertwined with Bequia itself. After the Seven Years War, Britain signed the Treaty of Paris in 1763, which gave them Saint Vincent and the Grenadines, of which Bequia is a part. Following the treaty, the British Government did a survey of Bequia in 1775 that designated seven vacant parcels that were, “appropriated for Forts, Batteries, and such Military and Naval purposes as may hereafter be found most expedient and necessary for the ‘defence’ of the Island”. The British then passed the land to the Saint Vincent Government when they became independent in 1979. In 2007 a part of this same land was purchased by the owners from the government to build Reef House. There is truly not a site like it on the island! As you step on to the Reef House property you sense its history. The house is nestled into the hillside and is constructed of local Igneous stone and Greenheart hardwood in a style that reflects the Caribbean tradition yet provides all the modern conveniences. The exterior walls are covered in cut stone which gives the house the feeling of a sea captain’s villa. The living spaces of Reef House are designed to be “as one” with the sea and sky. Spacious verandas emerge from the rooms on the first and second floors either overlooking the two bays below or a private garden filled with colorful flowers. Pairs of tall arched Dutch doors push open to reveal views of the turquoise sea, the off-shore reef with its constantly breaking waves, two islands in the distance and the palm tree lined white sand beach of Industry Bay located just a five minute walk below the residence. Reef House’s pavilion style is naturally cooled by the Caribbean trade winds that constantly flow in from the sea. As you enter the property, you see the lovely secluded terraced upper level garden with its attractive dry-stacked stone walls and plantings of colorful tropical flowers and trees. A ten foot wide covered veranda, with greenheart wooden posts and railings, faces the sea and off shore reef providing dramatic views of the surf and sky. The Upper Level consists of the master bedroom with its high-beamed ceiling and stone surrounded, nine foot arched wooden Dutch doors that open to the sea and cloud- filled blue sky. Two other doors open to the terraced entry garden. There is a generous walk-in closet, a stylish bathroom with dark green soapstone counter, teak Balinese mirror and a large walk-in shower with handsome walls of green marble tile and a slate tile floor. 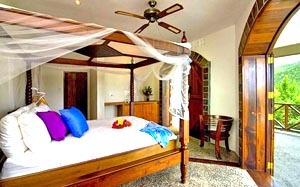 The master bedroom has a beautiful Balinese teak, king size four poster bed covered with a mosquito net. Next to the master bedroom is the open-air dining room with its artistic walls of cut stone and a hand-made dining table crafted from a large Silver-Bali plank of wood. This room has two wide Greenheart doors that, when open, create a perfectly framed breathtaking view of the off shore reef and sky. The spacious octagon shaped living room with kitchen follows next with its vaulted wood beam ceiling and handsome stone terrazzo floors crossed with wide strips of tropical wood. This attractive room has also been designed with six beautifully constructed Greenheart Dutch doors, each framed by a cut stone arch, and open to a magnificent vista of either the verdant tropical valley behind the beach or dramatic views of the sea, reef and islands. The kitchen, with its large, attractive dark green soapstone center island and counter space, is furnished with a stainless steel refrigerator, gas stove, microwave, dishwasher and large walk-in pantry. All the necessary small appliances, dishes and cooking equipment are provided. The Lower Level is comprised of three generously proportioned guest bedrooms and baths containing a walk-in tiled shower, soapstone counter tops and teak Balinese mirrors. Two of the downstairs bedrooms share a spacious bath with its large walk-in shower. There is also a media room for watching movies on the flat screen TV - please bring your own choices. A ten foot covered porch extends all along the front of the lower level rooms offering lovely views of the swimming pool, beach, sea and lower level garden. All of the three downstairs bedrooms have teak four poster queen size beds that were imported from Bali and are covered with a mosquito net. All the interior floors of the house are made of local polished terrazzo stone that has been crossed with wide planks of rustic wood. Hot water is provided from two gas hot water heaters and the house has both 110 and 230 electrical outlets. Wireless Internet service is available throughout the entire upstairs floor and verandas. Ethernet is available in each downstairs bedroom. For your added enjoyment, there is a plunge pool with an underwater bench designed for sitting and relaxing and taking in the sea views. WOW, what a gorgeous site with the most awe inspiring views! The exterior stone walls, tall wooden Dutch style doors and stone terrazzo floors make Reef House seem like an old Caribbean villa. You have the most handsome house on the island. Loved the quality of the beds. Loved hearing the ocean waves when lying in the bed. Loved resting and reading when lying on the teak chaise lounge couches on the veranda facing the sea, the reef and the offshore islands - hard to stay awake! The house is amazing -- made of exotic hardwood and native stone -- but with all the modern conveniences so you can enjoy the unspoiled beauty of Bequia without giving up the comforts of home. Perched on a hill, with spectacular ever-changing ocean views, you're just a short walk to the beach and a fantastic turtle sanctuary, where you can have one-of-a-kind interactions with Hawkbill turtles. Reef House is a piece of island paradise and we feel lucky to have experienced it! Our stay at Reef House in Bequia was magical. From the spectacular views to the beautifully appointed bedrooms and welcoming great room, it has everything you would want for a special and relaxing holiday. Bequia is a special island. It is the largest of the Grenadines and has a beautiful sheltered harbor, one of the best in the Caribbean. What visitors often say about this island is “how friendly” the local people are. There are no large hotels, “package deals “ with wristbands, no golf courses, casinos or even a Starbucks. 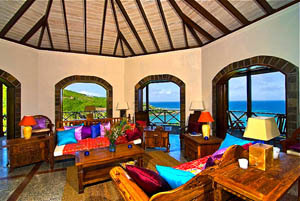 Bequia is an island that encourages you to relax and leave the stress of the urban world behind. Should you wish to be more active, there are lovely hiking trails, excellent scuba diving, swimming beaches and exciting wind or kite surfing (if you bring your own equipment). From the moment you get off the plane or ferry boat and you see the kids playing cricket or soccer on the grassy field that they share with the grazing sheep and goats, you know Bequia is different from the world you left behind. Bequia now offers a wide variety of very good restaurants. For those who wish to cook at home, there are several markets that offer almost anything you would find “at home”. Local fruit and vegetable produce is abundant and is sold either at the “Rasta vegie market” or from street vendors in the Harbor. Shopping at the local markets and street vendors is a great way to experience the island life.